Monthly Potluck: We like to eat, we like to laugh. The first Sunday of each month, we break bread together at a potluck luncheon in the Parish Hall after breaking bread together during the 10:15 a.m. service. All are welcome; there is always plenty of food to go around. Join us! Membership in ECW- Episcopal Church Women - is open to all women of All Saints Episcopal Church. Our mission is "to encourage the women of the church to share in the whole life if the church, bound together by their common love for God, their common concern for humanity, their common zeal for spreading the Gospel--by promoting and stimulating worship, study, service, and fellowship." The group meets the first Tuesday of each month, summer months excepted. Men’s Group: The men of All Saints (and visitors) meet monthly at a local venue for an evening of Christian fellowship. They also sponsor the Job Jar, where members can request help with tasks or minor repairs around their homes or at the church. Foyers is the French word for hearthside. It carries the image of a small group of friends or family members sharing a common love and concern for each other. Foyers are small groups, made up of couples or singles, formed at random, which meet at least once a month for a simple meal and relaxed conversation. This is a ministry of fellowship, intended to offer an opportunity to deepen old friendships and develop new ones. If you are new to our parish, Foyers is a wonderful way to meet and learn more about those of us who have been at All Saints for some time. There is no agenda; we are not a study group. Foyers is not intended to DO anything -just to BE what Christians are…groups of people who love one another. Please consider joining us; there is always room at the table. For more information on the All Saints Foyers Ministry, contact Bill or Sheila Freeman. Wine and Cheese: The Episcopal Church Women (ECW) host a wine and cheese tasting “night out” the Friday before Valentine's Day each February. This elegant evening is one of the Episcopal Church Women's major fundraisers for community outreach and church programming. The evening includes a silent auction and usually several high-end items for a separate auction- including a wine basket. English Tea: Join us each Spring for a Traditional High Tea fundraiser. Don your elegant hats, bid on delightful gift baskets, and raise funds for All Saints’ Youth and Community Outreach. English Tea: The ECW also hosts a traditional English Tea annually in the Spring. The event is a delightful afternoon out for mothers and daughters or couples. A basket raffle, hat contest, and door prizes are all part of this fundraiser for church programs. The 2019 English Tea will be held Sunday, April 28 at 2:30 p.m. More information can be found HERE; tickets are on sale now at the British Pantry and Tea Room or in the church office. Parish Picnic and Ministry Fair: In late spring, we gather on our beautiful grounds for a picnic with games for all ages. The Men’s Group handles the grilling and it’s a good time to learn about different opportunities to get involved without the pressure of going to a meeting.The 2019 Parish Picnic will be June 2. Marketplace: Held each fall, the Episcopal Church Women's Marketplace hosted 40 vendors in 2016. Vendor tables are sold for $35 and are placed in the Parish Hall, Education Building and under tents outside. 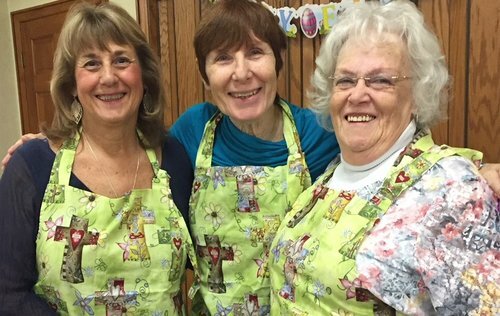 The ladies work on crafts during the year to sell at this major fundraiser to benefit community outreach and church programming. You can donate to the ECW room - craft items, white elephant items, antiques, etc. There is also a bake sale and this date kicks off pickup for preordered casseroles – another popular ECW fundraiser. Contact Linda Christie or Mary Mantiply for more information. Fellowship Committee: Meets after the parish monthly Covered Dish luncheon (usually the first Sunday of the month at 11:45 a.m.) and is responsible for planning and carrying out several social activities throughout the year, from Bunco and movie nights to Mass in the Grass and the English Tea. For more information or to help out, contact committee chair Anne Sanders.